When I was planning my Amber & Amethyst garden last year I wanted an arch at one end with a seat underneath, I bought a metal one which matched the gated arch at the entrance. The idea was to get a seat to go under it. The problem was I couldn’t find a seat that fitted within the arch and the arch itself wasn’t very stable. I decided what was needed was another wooden arbour. I started pricing them, but I then discovered a quirky wooden seat on Skipton market, it’s made from recycled chairs etc. 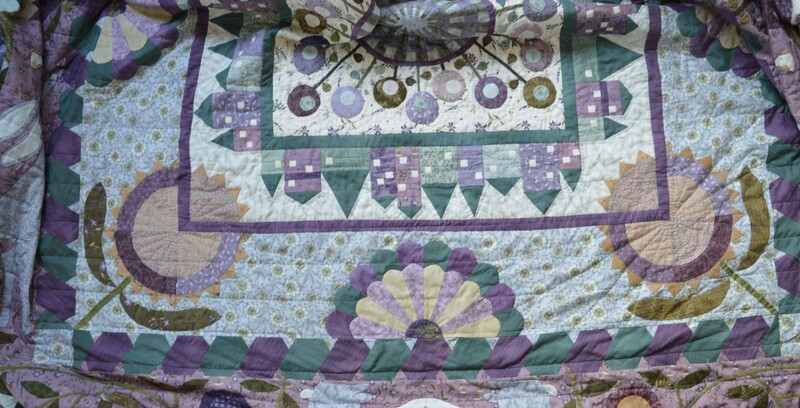 I love it, though my OH isn’t sure yet! I found a lovely looking arch on Remodelaholic, they have a video on you-tube as well as printable instructions. I can certainly recommend it, the instructions are straight forward, easy to follow and adapt. 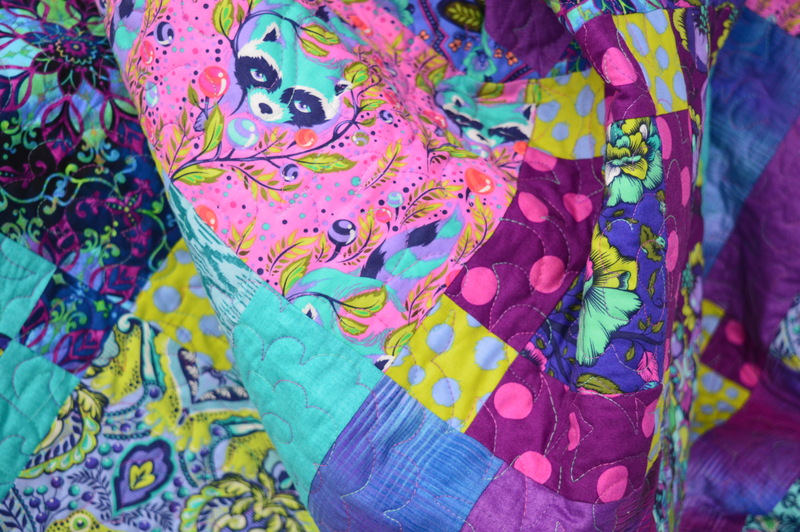 It was just what I needed, I could alter the measurements to make it smaller but wider. I ordered four 6′ uprights and found the rest of the wood around the garage, leftover from other projects. Six lengths were even rescued from the firewood pile! My plan was to make it over the Easter break! On Good Friday afternoon I started making the sides. One design feature I liked with this arch is the ‘trellis’ bit, the design just had three long lengths, I made my arch wider so I made it with five lengths instead. It’s much easier than traditional trellis, it’ll be easier to paint and the plants will grow up it the same way! The wider wood at the top helps to stabilise it, and also supports the top. This is the bit I rescued from the firewood pile, it’s actually slats from a bunkbed – I didn’t even need to shorten them! By the end of Good Friday I had two sides made. On Easter Saturday I concentrated on the top. The ends needed shaping, luckily I’d been able to borrow a professional jig saw off my son, it is useful when you have a son with a trade! I’d not used a jig saw before but I drew my curvy line and went for it! I was really pleased how they came out. I loved using it that much I shaped the side ends too and used the saw for cutting all the lengths to size! The length of the top was determined by the length of wood we had left, 4.2m, so each side is 2.1m, just long enough. I cut a few battens and spaced them evenly across the top. I put them fairly close together as I knew the arch was only 6′ tall so I wanted plenty of support for the climbers along the top. The top had to neatly fit across the sides, so I lay them together whilst I was screwing them in. 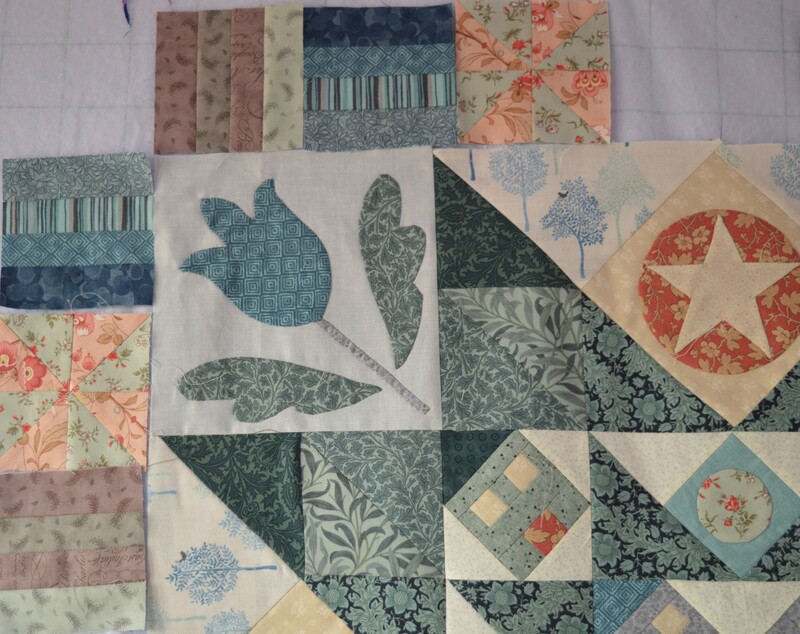 Yes that is a quilting ruler you can see in the middle, perfect for working out 45′ angles and small measurements! Easter Monday was putting it all together day! I’d got a set of metal spiked post holders to support it and this was the bit that caused the most hassle. Clearly the spikes had to be exactly the right width apart so the sides would slot in, there wasn’t much room for ease. I measured as I sledge-hammered them in, checked the side half way, but whatever I did one spike seemed to twist. Luckily I could just about get the side in. For the second side I decided to enlist the help of my OH, he held the side up whilst I slotted it in the spikes and then pushed them all down together. We got them about half way before I needed the sledge hammer, but one still twisted!! Luckily I could still stand the side in them. My worry then was that if the sides were slightly askew, the top might not slot down, as it was a pretty snug fit!. It took a bit of persuading but I finally got the top on and screwed together. The last bit to do was attaching the diagonal bits on the corners (bed slats again!) I was meant to drill from the bottom corner through to the upright post. I had problems anyway as my drill wouldn’t stay on the curved edge, I made a hole with an awl, drilled the hole up to the hilt but it didn’t even come out the other side, never mind into the post! I consulted with my OH and he remembered some little metal angles in the shed and luckily it worked. I’m well chuffed with my arbour, it feels pretty solid, it’s not bolted to the posts as I couldn’t work out how to do it, but it doesn’t feel like it will go anywhere. It just needs a coat of paint now and I can put my new seat underneath it. On Thursday we’re going to the Harrogate Flower Show, so clematis is now on my shopping list! 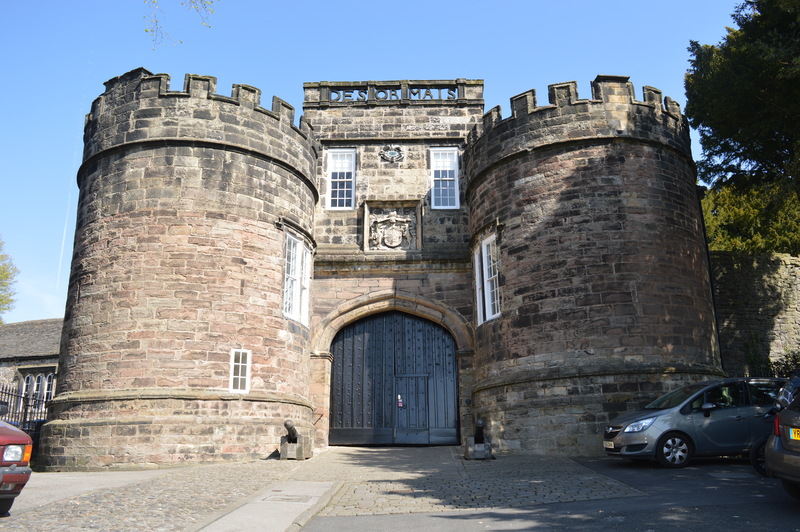 This is Skipton Castle’s main gate, designed to intimidate with it’s huge oak door, castellated towers and cannons either side. It reminds me of a face, not a very friendly one either! This beautiful farmhouse is next to Embsay church, you can just see the Victorian bell tower peeping over the top. it seems perfectly settled in it’s surroundings, I love the sixteen paned windows, but I wouldn’t like to clean them! 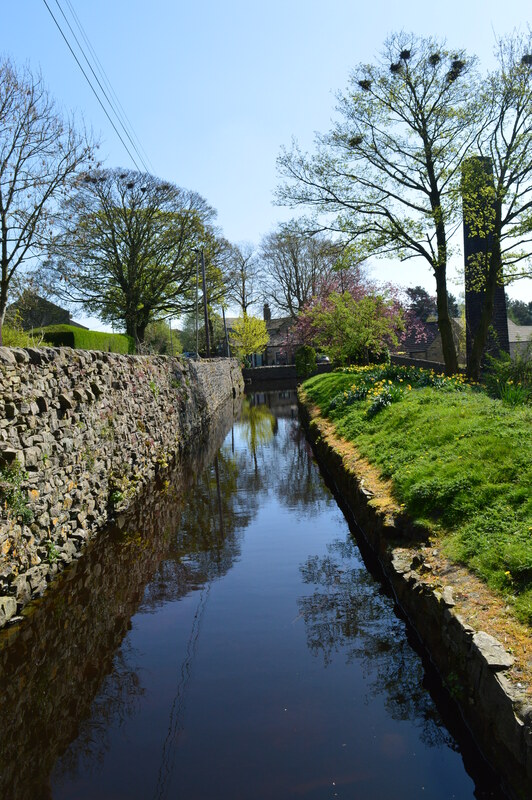 Eastby is a little village right next-door to Embsay. The old Methodist chapel is now a very nice home. I always fancied a house with an arched window, I remember telling my OH this, he didn’t look perturbed as he obviously didn’t realise at the time that these usually came on very large (and expensive!) Georgian farmhouses!! Just on the way out of Eastby we came across a very unusual window on the side of a farmhouse, it’s only little, about eighteen inches tall maybe, at the most, including the frame. I’ve never seen a window like this so I have no idea of it’s significance. 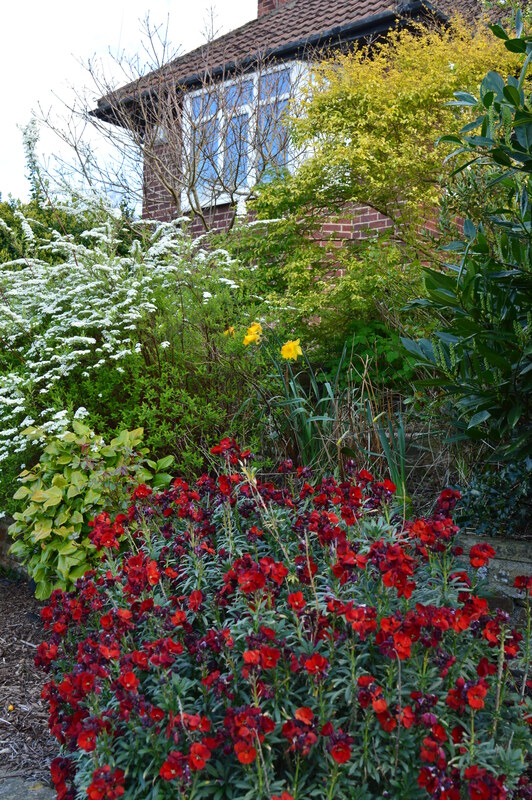 This photo challenge is organised by Wild Daffodil, so why not pop over to her site and see lots more windows. 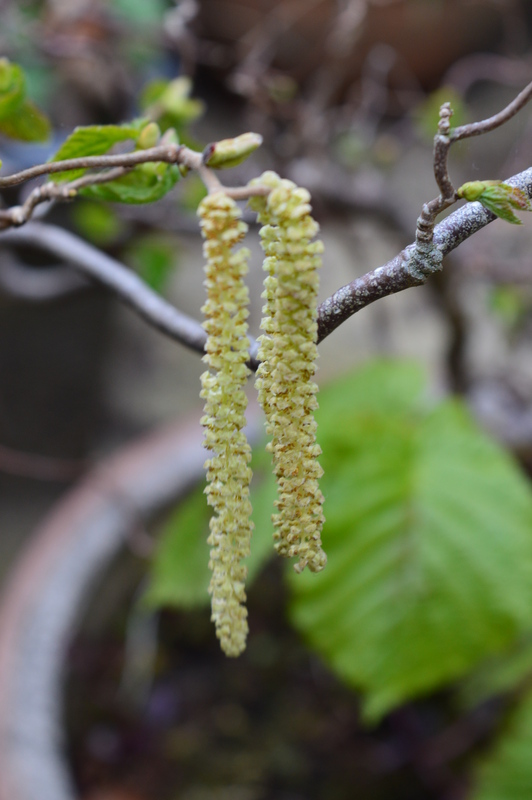 We’ve had a very dry spring here in Yorkshire, so flowers and blossoms seem to be earlier from the warmth but some plants and shrubs are struggling with the lack of rain – I’ve actually been watering plants I’ve put in this year which is very unusual for April. April is known for it’s showers, but hopefully (however much we enjoy the sunshine!) the weather is going to break on Wednesday with thunderstorms and then showers for about two weeks, it’s what the gardens and the countryside need. 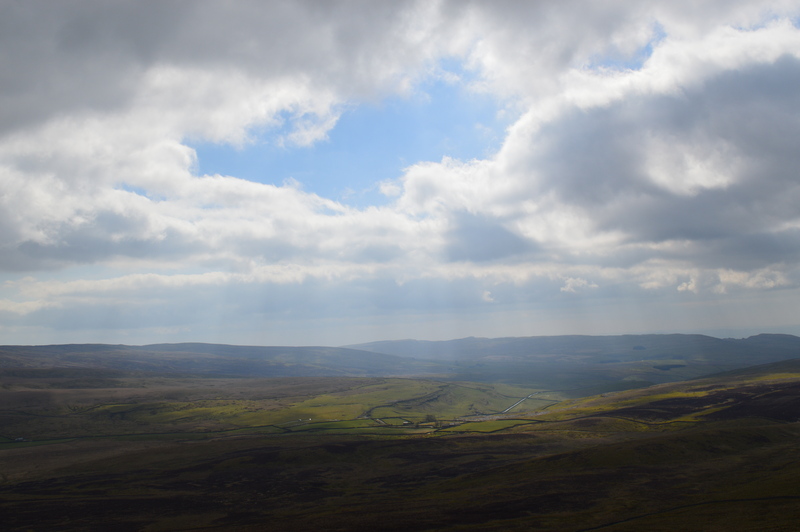 Ilkley moor was on fire Saturday night and two more moors are on fire tonight – we need rain!! Everything seems to be shooting up at the moment. In front of the pond is an ever-increasing patch of Solomons Seal, they seem to be growing several inches a day, they’ll be flowering within a couple of days. The erithroniums are all flowering (dog toothed violets), I think this one is called Pagoda, it’s a delicate, nodding, yellow flower. The patio area is starting to fill up too, we had coffee out there this morning on the bench that will eventually be under my new arbour. There’s a small aquilegia just starting to flower, it’s has very pretty blue and white flowers, behind it is the foliage of another taller aquilegia shooting up, I think this one has creamy flowers. I’m planning that this bed will be soft blues and creamy whites, so there’s a purple sage, a creamy white standard rose and a very pretty white cytisus (broom) that was an impulse buy at last years Harrogate Flower Show. The mauve perennial wallflower has been flowering for a while and will probably continue most of the year. At the other end of the patio is the arbour, there’s a rose called The Generous Gardener growing up the right side but up the left is an alpine clematis, it’s one of the earlier flowering clematis so it looks really pretty at the moment with it’s nodding blue bells and lime green leaves. Over in the Amber & Amethyst garden is my new pride and joy, the result of my toil and labour!!! My arbour, soon to be painted with a seat below! Next to it is an obelisk I made a couple of years ago, I’m really pleased how the rose is covering it this year, I made a concerted effort to tie in branches earlier in the year and it seems to have paid dividends! The tall purple flowers you can see in front is the plant I was trying to identify a few weeks ago, I think it’s a purple leaved honesty, which has lovely silvery seedpods like papery moons. I don’t often show you the front garden, but at the moment there’s an eschordia The Bride in flower, I only planted this a couple of years ago so I’m pleased it’s already giving a good display of blossom. 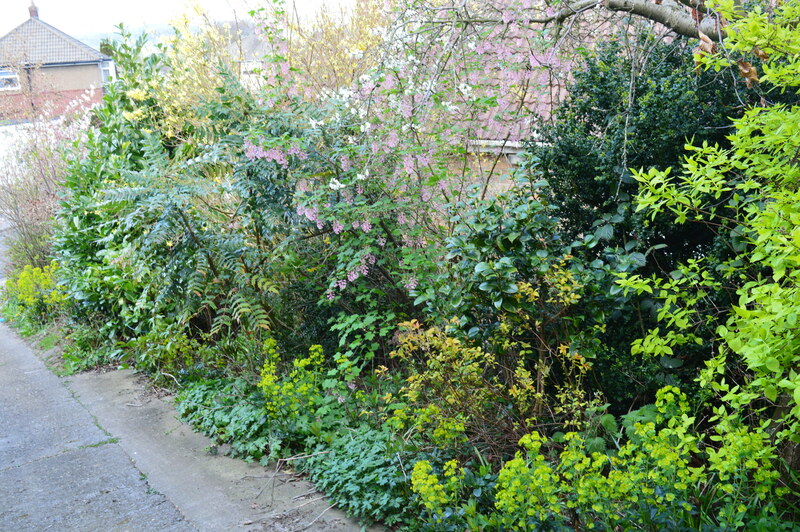 In comparison, I planted a magnolia, probably about fifteen years ago, and it’s still a bit miserable! I love magnolias, but I made the mistake of planting a purple flowered one, having only seen pictures, not the real thing! Somehow the purple always looks a bit drab, always seems to get hit by frost worst than other colours…and it’s still only about five feet tall!!! It’s the Harrogate Spring Flower show this week, my friend and I are going on Thursday, it’s one of our annual treats! I need some clematis to grow over my new arbour and I’m sure I’ll be tempted by a few more plants! 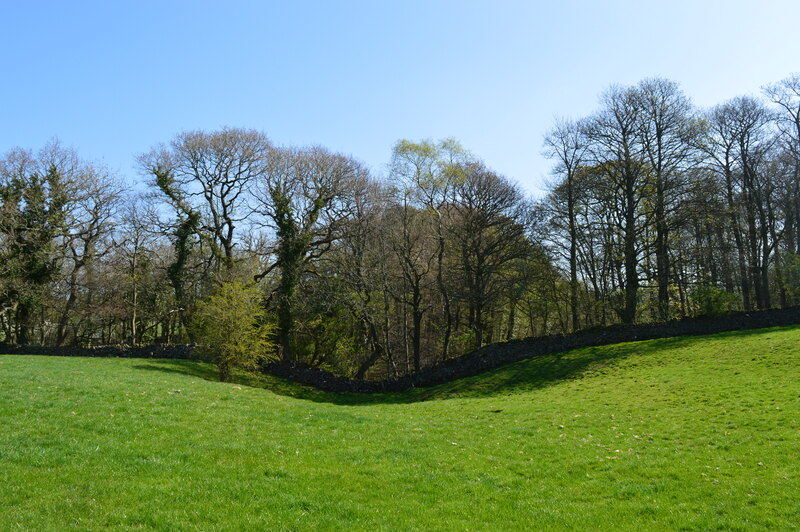 We’ve had a very dry spring so far and the weather over the Easter Bank Holiday has been glorious, hot and sunny. My OH and I decided to go for a walk and my walking buddy joined us, we had a great day out. We’ve decided to walk Lady Anne’s Way as practice walks for our big walk in June (Cleveland Way). Lady Anne’s Way goes from Skipton to Penrith, 100 miles in total! We’re just doing it in bite size chunks so we might not finish it til next year but it gives us something concrete to do rather than just finding local walks to practise on. On the way up to Skipton we drove through Ilkley. Last night, as a result of all the dry weather we had (and I suspect a BBQ!) 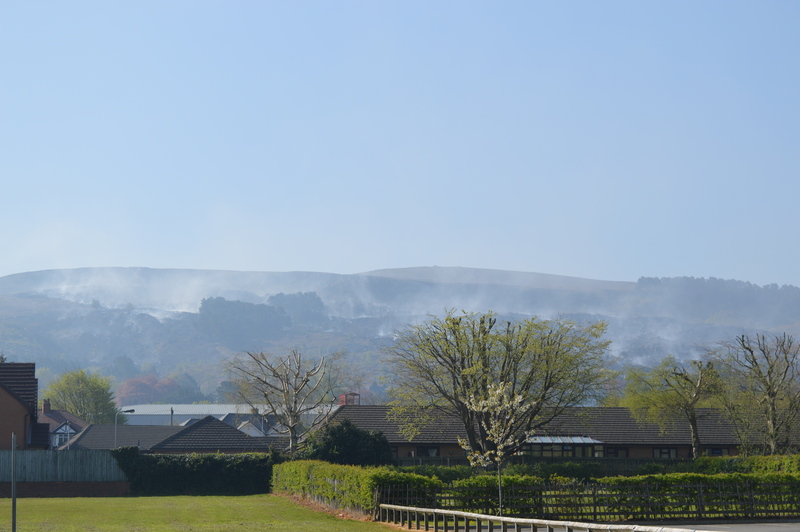 there was a large moor fire on Ilkley moor, as well as dozens of fire engines they were using helicopters to drop water. This explained the ‘low flying airplane’ I thought I’d heard in the night! This morning much of the moor was still smoking, it was quite shocking to see. Fingers crossed it stays under control! The walk starts at Skipton Castle, which is about 900 years old! Lady Anne Clifford was born there in 1590, she was the last Clifford to own Skipton Castle. We rose quite quickly out of Skipton, well what I should say is the path rose steeply out of Skipton, we huffed and puffed our way up, stopping to admire the view lots of times! 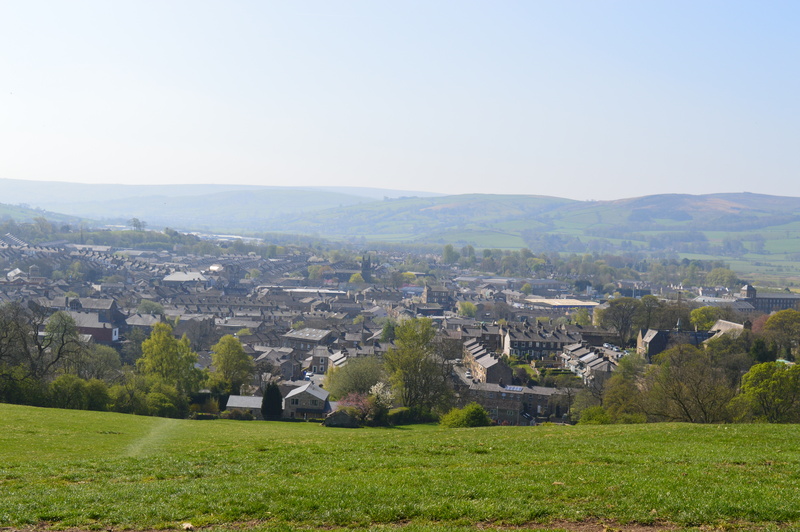 We then made our way over undulating farmland to the village of Embsay, where my walking buddy lives – we resisted calling home for a cuppa, instead we sat in the shade of a beautiful tree to have our first cup of coffee and a banana. We skirted mainly around the edge of Embsay, following various snickets and ginnels around the houses. We crossed the ‘duck pond’ which is the old mill race, you can still see the old chimney from the former tannery. We walked up through Eastby village and along the fields to Billy Bobs!! Billy Bobs is an ice-cream place, they make the ice-cream on the farm and have a huge American Diner type place with lots of play areas for kids…we just wanted an ice-cream! 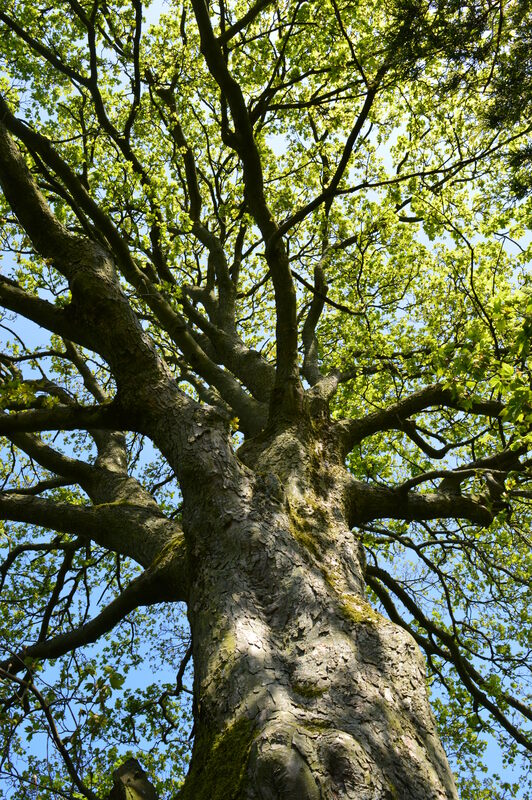 The trees are starting to come into leaf, you can just see flushes of green and bronze as the new leaves unfurl. It always fascinates me how different trees come into leaf at different times, hawthorn is one of the early ones, where as sycamore and beech are much later. There is an old saying that ‘if the oak before the ash we shall have a splash, if the ash before the oak we shall have a soak!’ I’ve not seen either in leaf yet! I love the dip in this photo! There were LOTS of styles on this walk, this one was fairly tame but most went over dry stone walls about 5-6 feet tall, and many were clearly designed for people with longer legs than me! All this warm weather has brought the tree blossoms and the wild flowers out early, the fields and the hedgerows were dotted with colour, we saw violets, dandelions, daisies, coltsfoot and some tiny little pretty white flowers which we didn’t know the name of. 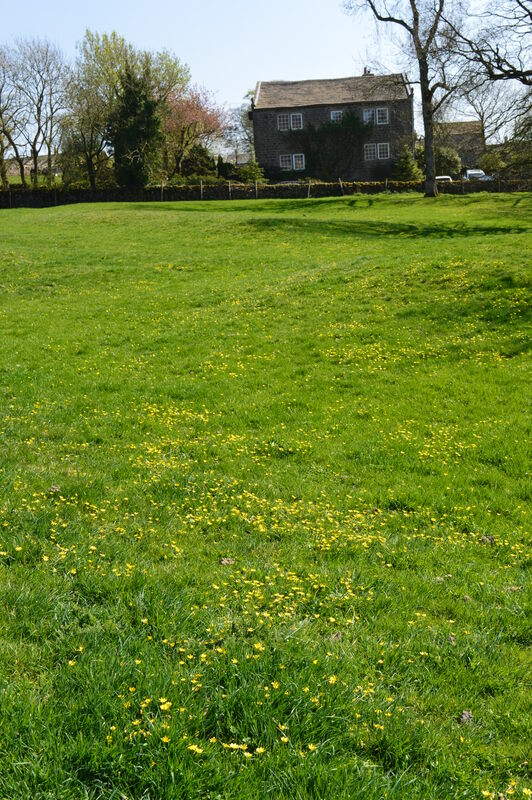 This field was full of celandine, it looked lovely. 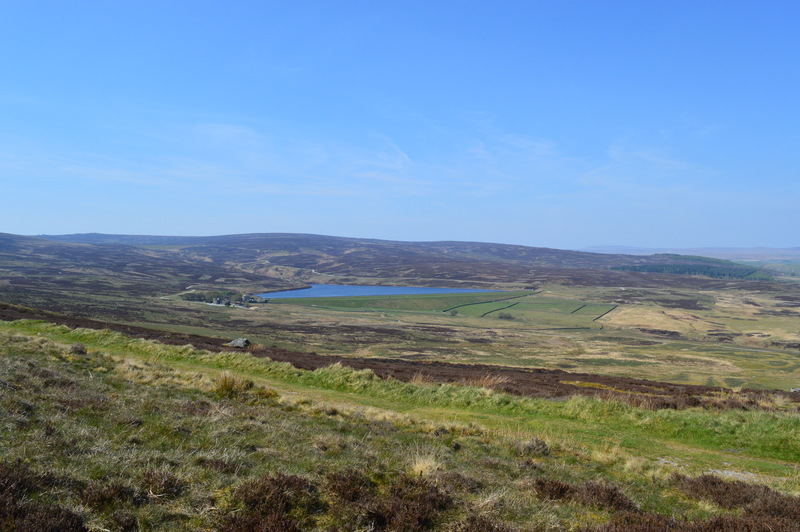 After the ice-cream we had a long pull up and over the moors, it was worth it when we saw the view at the other side, especially as we knew the car was parked down there ready to take us home! We walked about 7.5 miles altogether, so not too far. 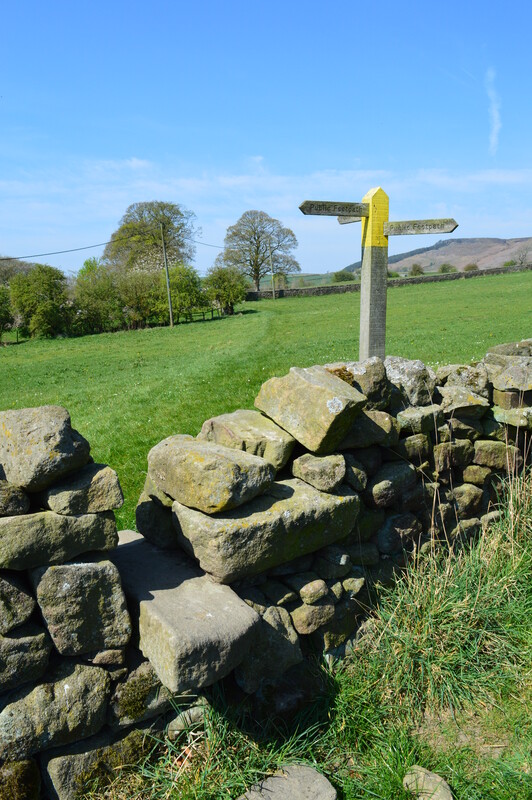 We’re planning to walk the next section on Tuesday, Barden to Grassington, I’m hoping it won’t be quite so hot! 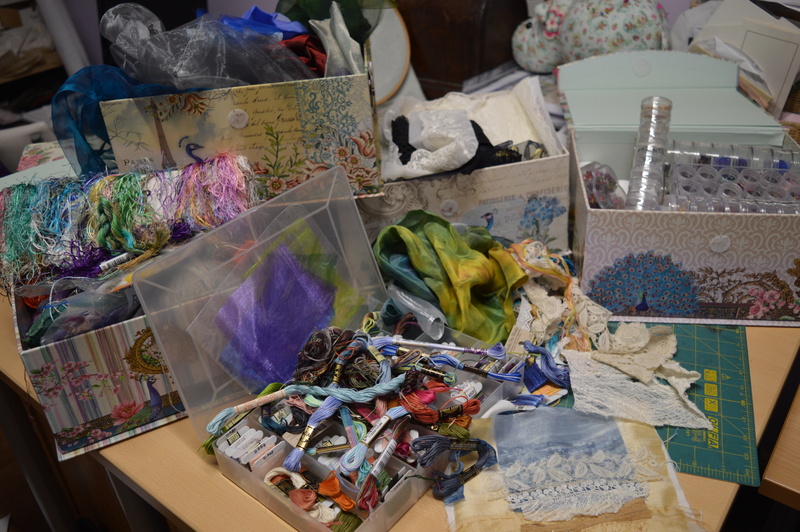 Last year I took part in a stitch-a-long called Lizzie SAL by Faby Reilly, it was a beautiful sewing wallet with lisianthus flowers decorating it inside and out. This years SAL is called the Zoe SAL, I still haven’t worked out where Zoe comes in but I’m sure it will become apparent! This time we’re making a box. Our prep work included stitching the outlines in back-stitch with markers every 10 stitches to help with counting. 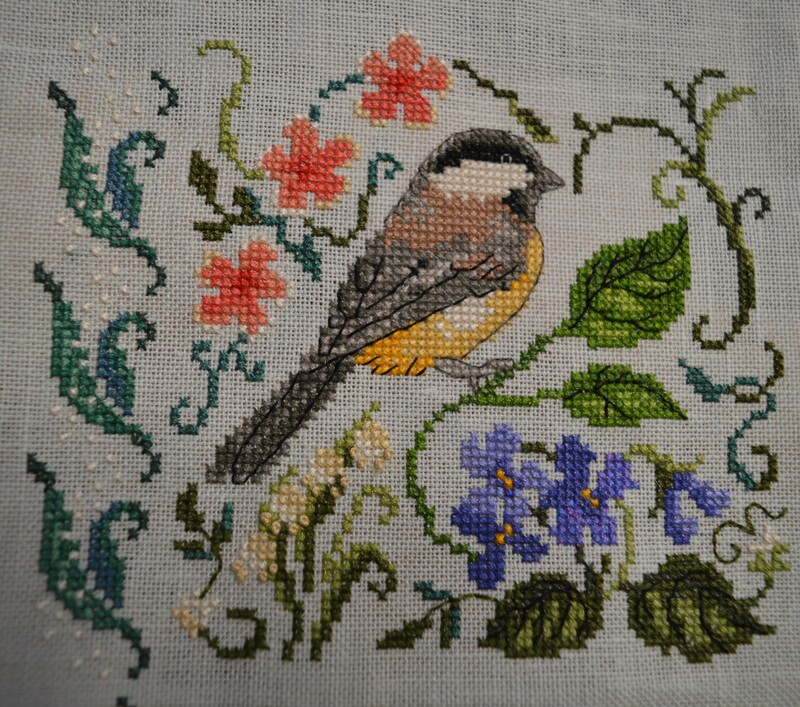 I use this technique a lot now as it is so much easier if, for example, a line of 200 stitches is required! I’ve manged to stitch the box sides and I’m half way through the lid sides, but I’ve plenty of time to catch up. The project is stitched on platinum linen, I’ve no idea why it’s called platinum, I was expecting a silvery grey, it’s actually more of an oatmeal! 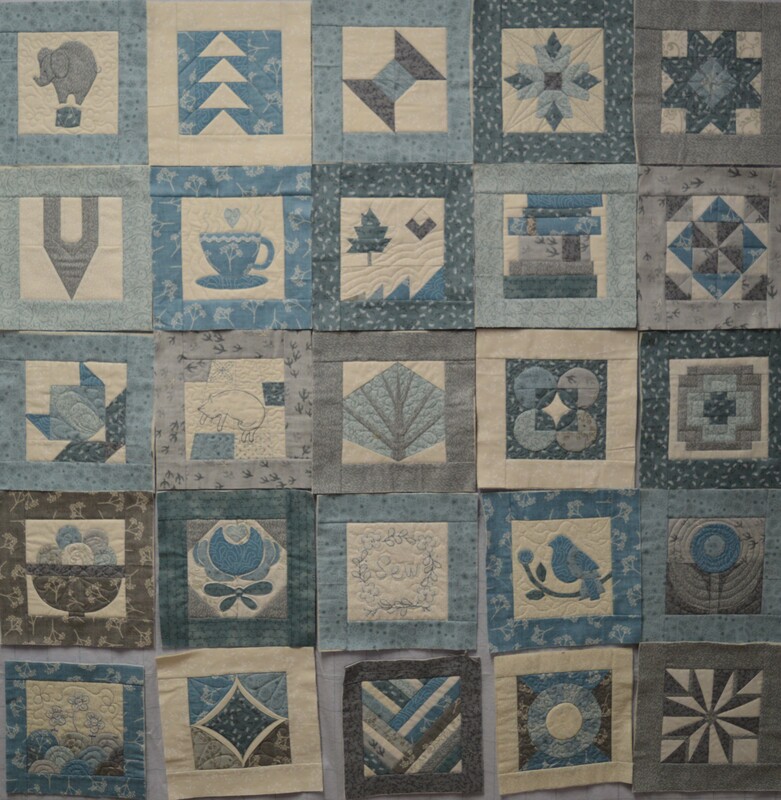 The designs are released every two weeks, this time we’ve got quite a light fortnight, supposedly to help us catch up with outlining, in practice I think I’ll will be more trying to get ahead with other projects, maybe finish one or two! We’ve started on the side of the box, I can already make out a very pretty robin, at least I think it’s a robin! There’s also several patches of white and green which will probably make more sense in the next set of instructions! I’m just hoping I’ve placed these OK as counting has never been my strong point! I even tacked down the 50 stitch line (the edge of the side) every two stitches, unfortunately I picked a grey thread that was hanging around and I can hardly see it! 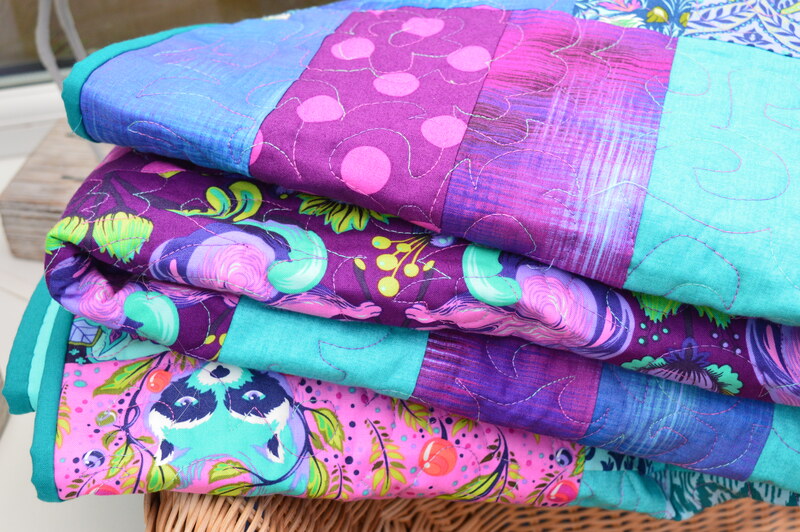 So there’s not a lot to show at the moment, but with a fortnightly pattern release that should change pretty soon! 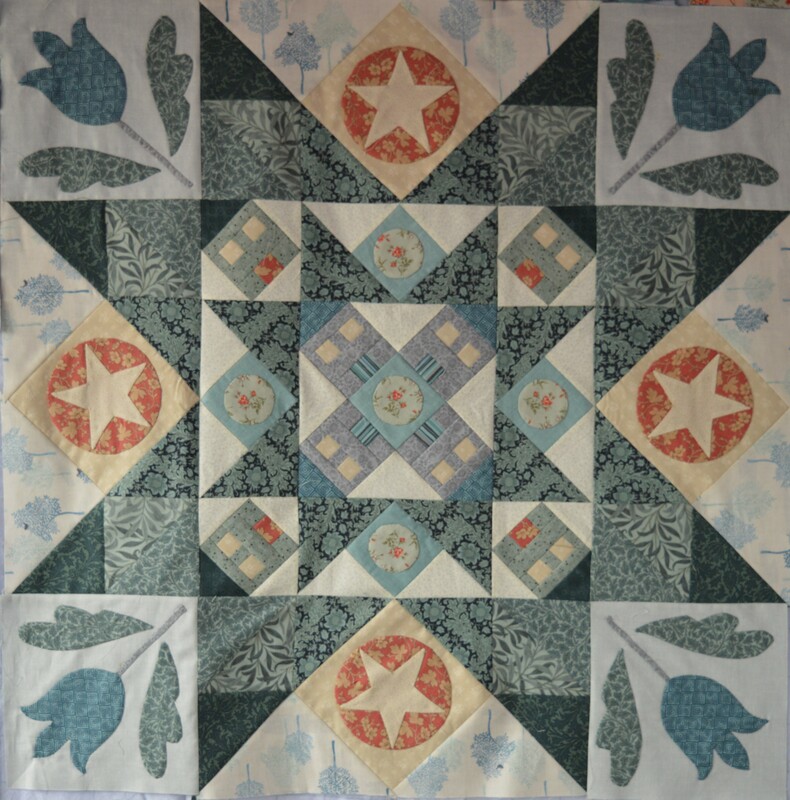 Last month we stitched the larger star border, but we couldn’t stitch on two of the sides until we had made the cornerstones this month. 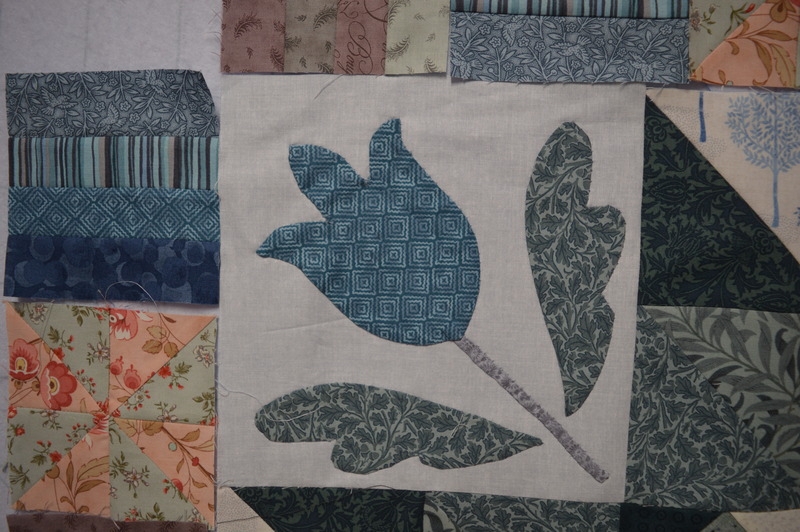 The cornerstones each have an appliqued tulip, it took a while to choose my fabrics as my instincts were to have an apricot tulip, in fact I have one cut out, I tried all sorts of backgrounds with it before I realised it was the apricot that was the problem. 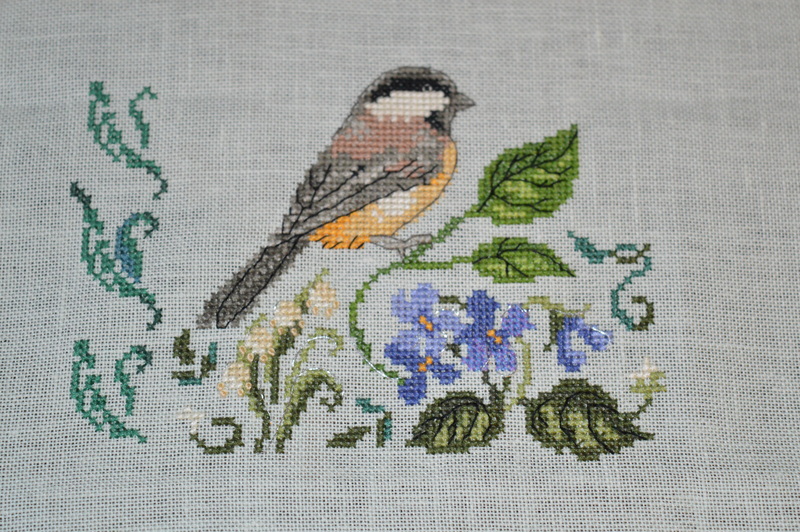 The soft grey background is actually the back of the fabric, it was just a touch lighter and I preferred it. 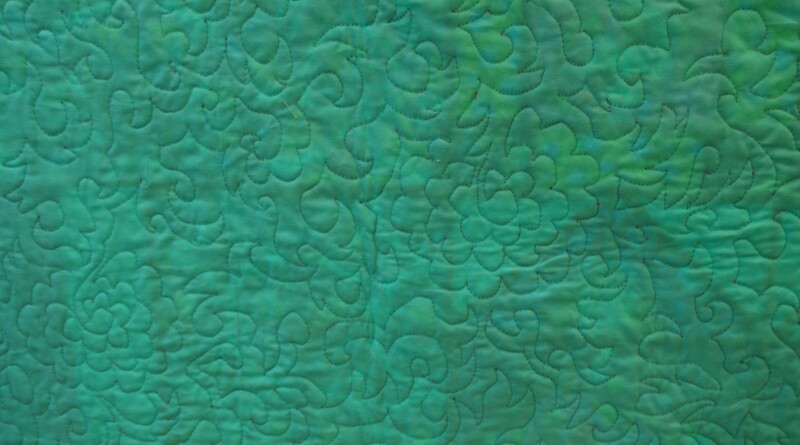 I tried the brighter teal blue and it just worked.The applique tested all sorts of skills, inside corners, outside corners, inside and outside curves as well as making quarter inch binding for the stem. I expected the tulips to be hardest with all the corners, but I actually found the leaves trickiest to get neat, from a distance they look fine…and nature isn’t perfect! 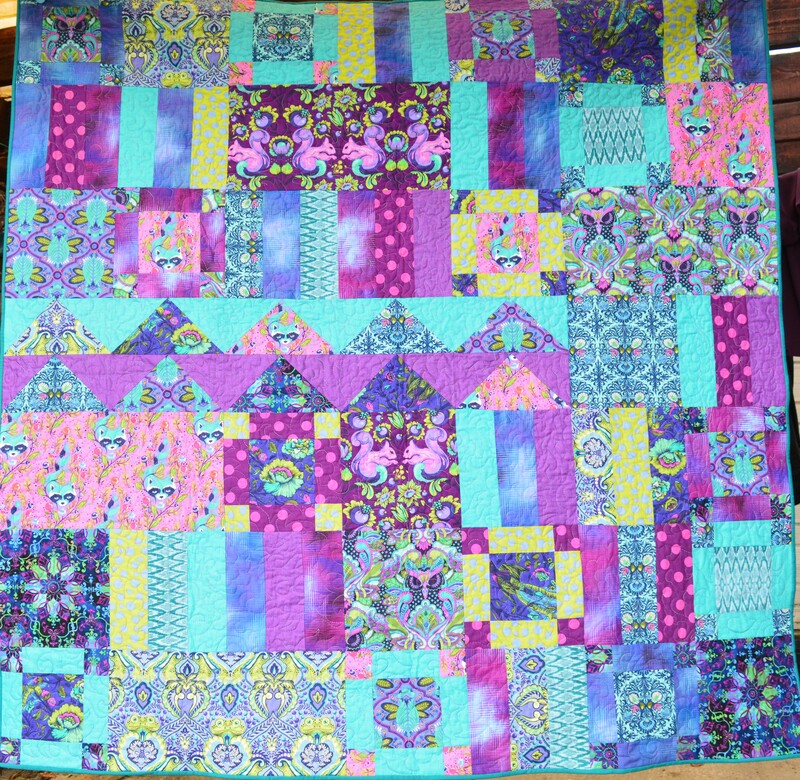 Once the four corners were stitched the central block could be completed, it took a bit of fiddling to get it to fit, I think bias on the triangles was the main culprit there. We also started the next border which is a row of houses. 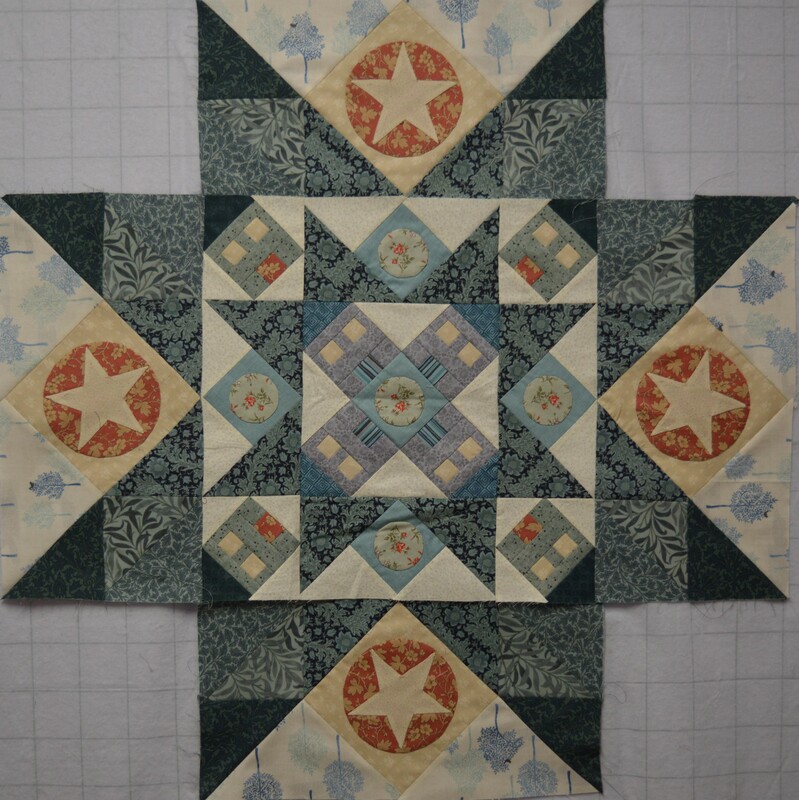 I made four sets of three house styles, two are striped which can go either way and the last one (my favourite so far) is a pinwheel block, it worked really well in apricot and green. I think next month we’ll be making another four houses and adding all the roofs. I think they’ll look pretty cute! 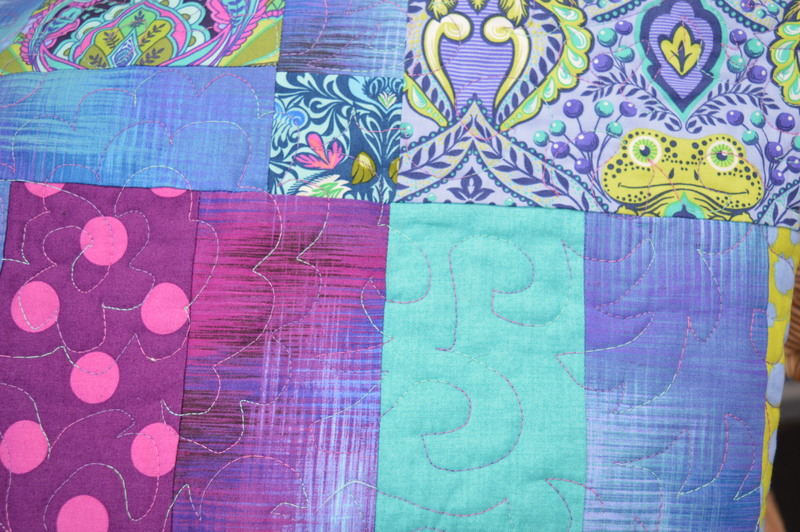 The centre block is already 32.5″ square, the pieces do seem pretty big after some of the quilts I’ve made recently! I’ve just to wait until the end of the month for the next installment. The tongue twister of my childhood was full of ‘S’s, I decided to do a seaside theme and the idea grew pretty quickly and I was quite amazed how well it came out! 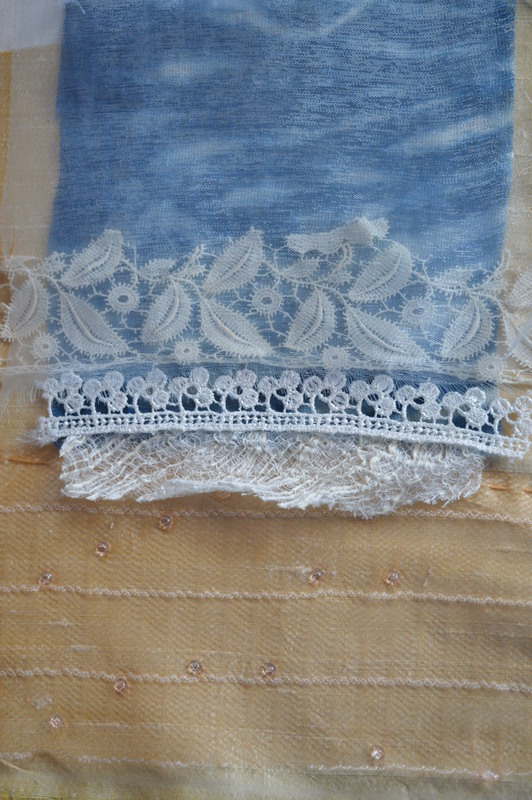 I tried to stitch the various layers on with different embroidery stitches, such as fly stitch or just straight stitches within the lace design. I used two different laces, one of which is so old it’s probably classed as vintage! I also used two different textiles, I’ve no idea what they are called, it’s the sort of thing I fall for at a show and then wonder what on earth I’m going to do with it, well one of them was perfect for the breaking waves, the other made the wet sand. 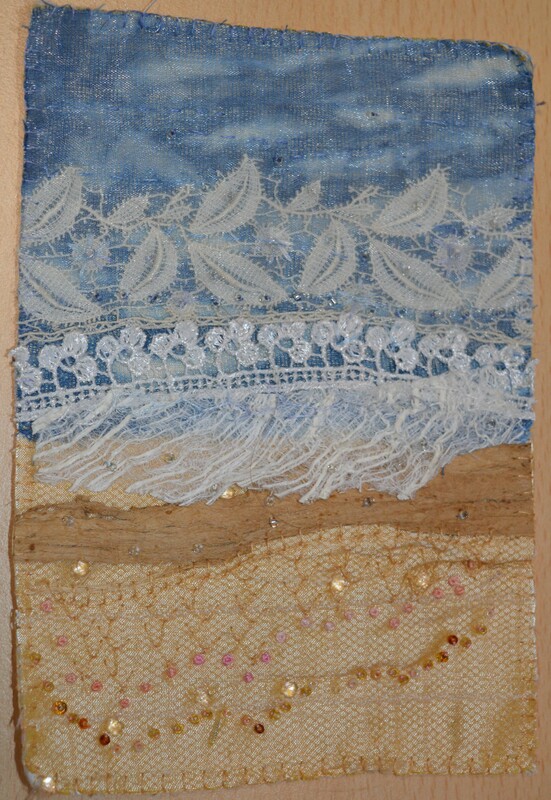 I embroidered feather stitch on the sand, trying to give it a bit of an organic shape. I followed the shape with some shell pink french knots. When I was little we used to have family holidays in Prestatyn in North Wales as my grandparents lived about five minutes from the beach. I used to collect dozens of tiny pale pink shells from the tide line. 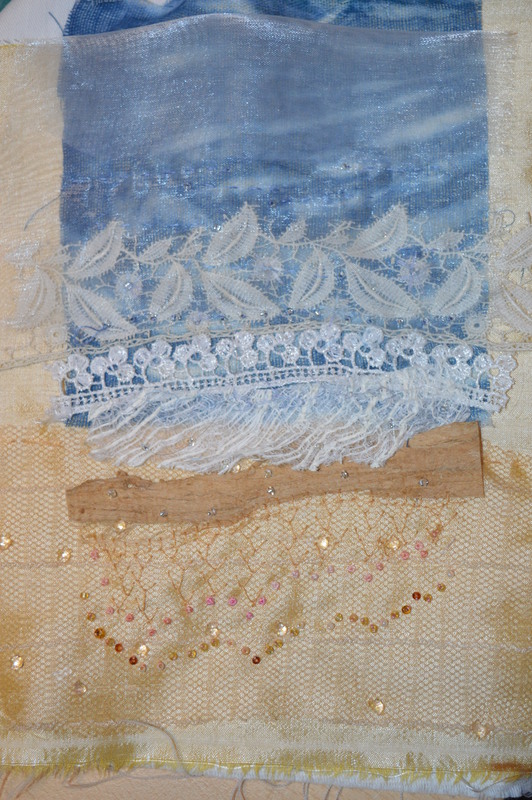 Another tide line is stitched with a variety of tiny beads. 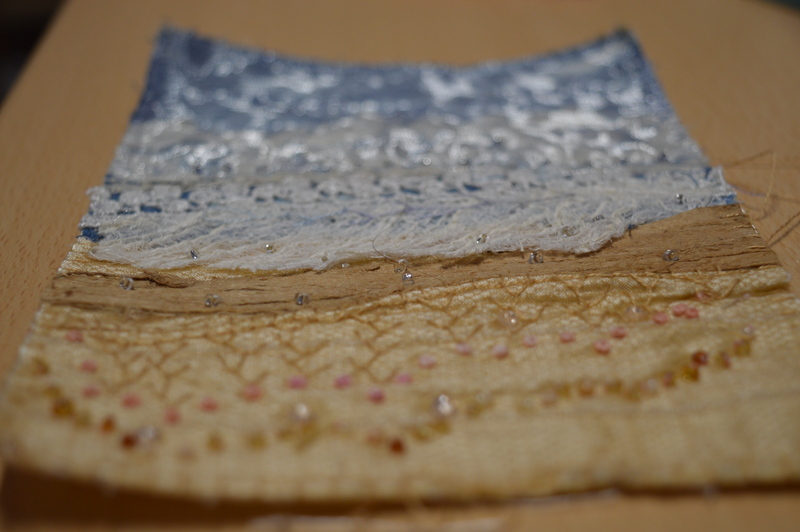 To add a bit of sparkle to the sea I overlaid some silvery organza and stitched on some particularly sparkly beads. 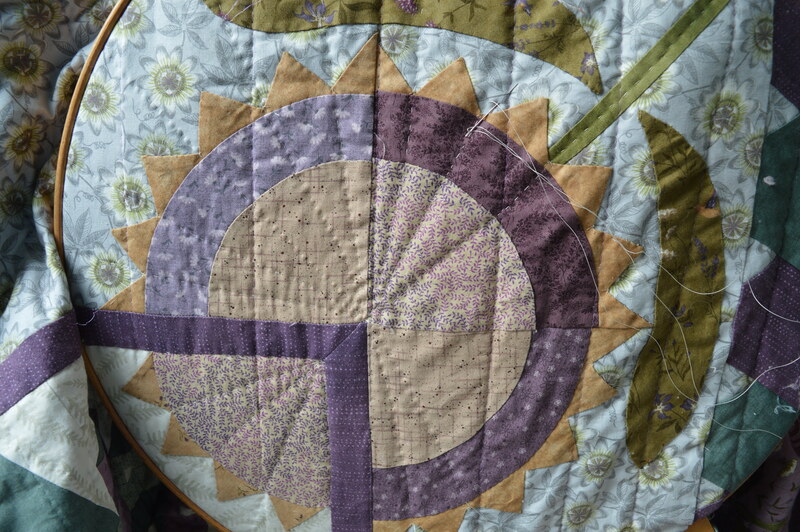 To finish it I stabilised everything with some vilene on the back and blanket stitched round the edge. 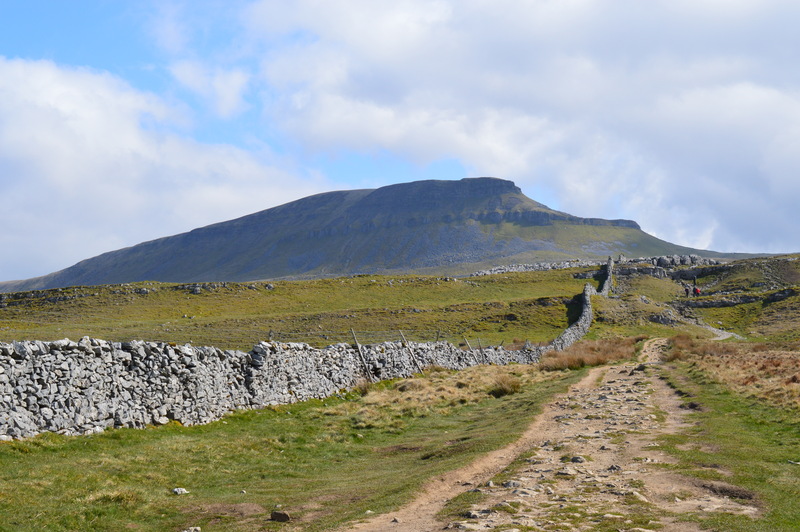 Pen-y-ghent is one of ‘The Yorkshire Three Peaks’, the other two being Ingleborough and Whernside, they are all within fairly close proximity so there is a popular local challenge to walk all three in twelve hours, a distance of about 26 miles. If you register at the pub at the start you can get a certificate at the end! In May a group of forty colleagues from work are going up to stay for the weekend and walking the three peaks on the Saturday. It should be a great weekend as there is a good mix of people, doctors, nurses, radiographers and cardiac technicians, all ages, I’m really looking forward to it. I did make it clear right from the beginning that there was no way I could do all three, I know my limits! I’d just do one, one of the doctors is also just doing one so I’ve got someone to walk with. However, I decided I wanted to do a practice walk, make sure I could actually do it (I’ve got no balance) as I really didn’t want to throw a wobbly with one of my work colleagues! Yesterday we decided to tackle it, it was a nice clear morning, though it was pretty cold, we needed extra jumpers and hat and gloves! 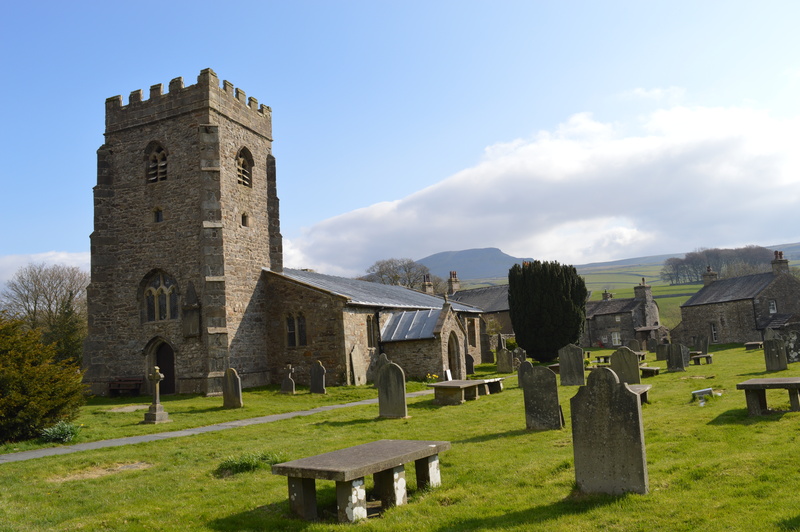 We parked at Horton in Ribblesdale and set off, there was a lovely view of the fell from the church, we were climbing up the steep right hand flank and coming down the gentler left hand side. As soon as we gained a bit of height the wind started, and it was pretty strong, we were walking straight into it so it was hard work. Strong winds always make me a bit nervous when I’m walking as it’s so much easier to lose my balance. 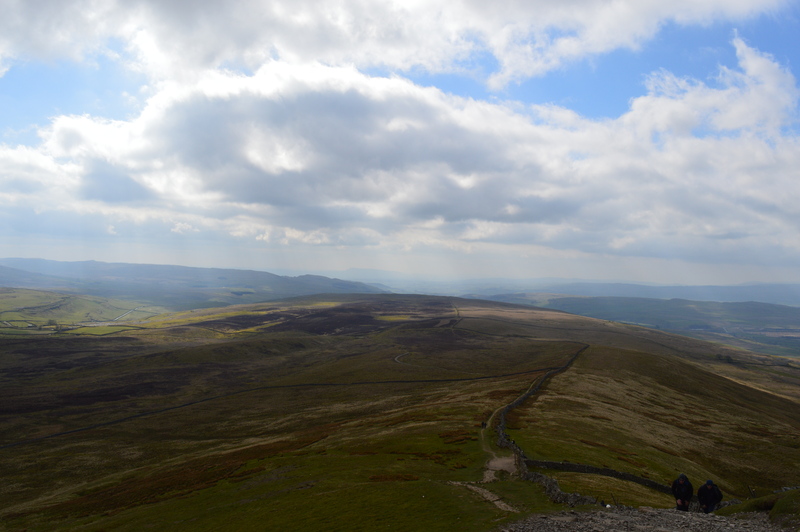 The path up Pen-y-ghent is pretty much straight up with varying degrees of steepness, so we had several rests on the way up, taking a photo of the view is always a good excuse! We decided to assess the wind when we got to the start of the final ascent, however having scrambled up one steep bit there was no way I was going back down it so we were committed! Climbing up the final flank is a steep scramble, all hands and feet required! There’s no photos of this bit as the camera went in the rucksack! At times there was quite a precipitous drop beneath us so we had to keep calm and hold on! At the moment I’m reading a book by Simon Ingram called Between the Sunset and the Sea, it’s all about climbing mountains, he describes the fear and exhilaration you get climbing a mountain perfectly! We finally reached the top, it was pretty busy up there but some gentlemen squeezed up on the stone bench in the windbreak shelter so we could sit and eat our sandwiches. It was a fairly busy route really, it’s popular anyway and it’s also half term so there were a few families out walking, we reckoned over the walk we saw about 50 or 60 people. 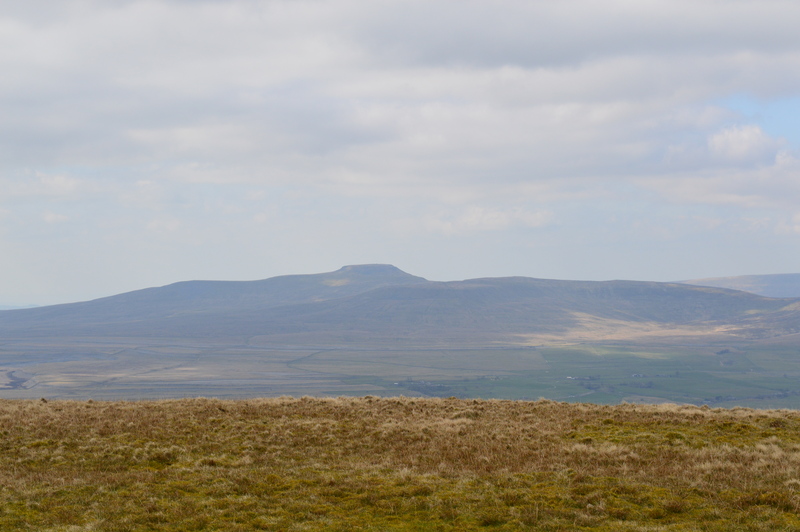 There was a good view of Ingleborough from our sandwich spot at the top, I was so glad we weren’t heading that way today! The way down is much easier terrain, though a slow descent is hard on the knees. We did a short detour to see Hull Pot. 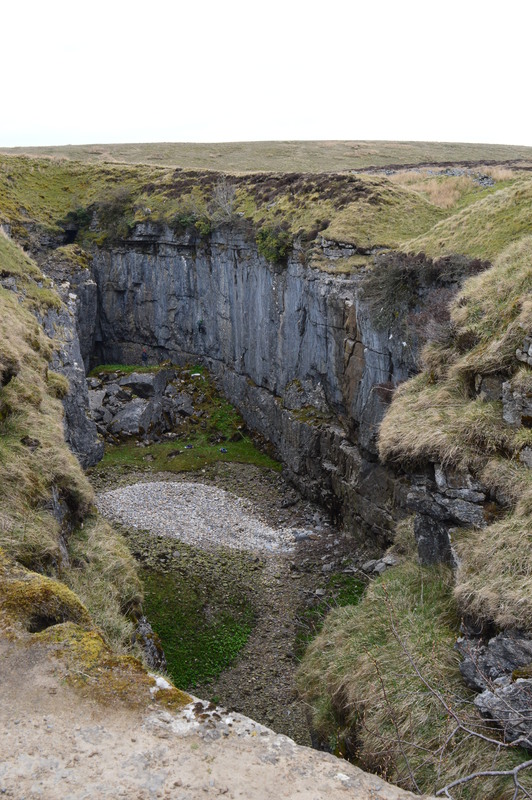 This is a huge pothole, a collapsed cavern really, what brought it to our attention is that a few weeks ago there was a sudden downpour, 5″ rain fell in a matter of hours. The whole pot flooded! There’s some photos here if you want to see. Hull Pot is about 60′ deep and wide and about 300′ long, you can just see some climbers at the bottom. It was quite awe-inspiring to think of it flooding so quickly. 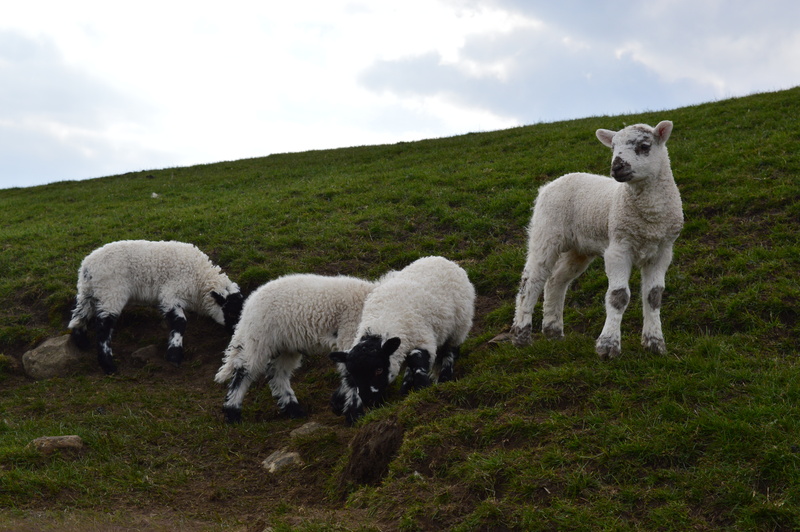 We saw some very cute lambs on the way down, which helped to distract our tired legs! Altogether we walked about eight miles, it took us about five hours including lots of breaks (sausage roll break, coffee break, sandwich break, sticky bun break…) but it was pretty tough terrain for me and straight into a strong wind so I’m pretty pleased with that. At least I know I won’t throw a wobbly on my colleague in May!